Felix Stefanile was a distinguished poet, translator, editor, and critic. He published seven books of verse as well as three significant volumes of verse translation. For forty-six years (1954-2000), Stefanile and his wife Selma also edited and published Sparrow, one of the liveliest poetry magazines of the era. During this long editorial tenure, he became a spokesman for the “little magazine” movement. In 1961 Stefanile, who had been working as a civil servant at the New York State Department of Labor, began teaching at Purdue University where he eventually became a full professor. He won a Balch Prize, a Pushcart Prize, and an NEA literary award. In 1998 he became the first recipient of the John Ciardi Award for lifetime achievement in Italian American poetry. Despite his many accomplishments, however, Stefanile never became widely known as a writer. He was not quite obscure, but he remained an outsider to the poetry establishment. Personable, gracious, and notably generous to young writers, Stefanile nonetheless cultivated the identity of the amiable but uncompromising outsider.Stefanile’s outsider status was not so much accidental as deliberate. Although he would certainly have enjoyed greater visibility in literary circles, he was too independent, frank, and contrarian for much success in literary politics. Personable, gracious, and notably generous to young writers, Stefanile nonetheless cultivated the identity of the amiable but uncompromising outsider. The role suited him well because it exactly fit who he really was—a writer of high standards who didn’t bend them for his own or anyone else’s sake. As a poet, Stefanile presents a series of interesting paradoxes. He was both a nationalist and a cosmopolitan. Although he consciously worked in “the American grain,” his poetry was nourished by its deep roots in European literature. He championed free verse but also wrote in form. From his earliest work till his final publications, he was unwilling to give up one mode for the other. In The Dance at St. Gabriel’s (1995), for instance, one finds a prose poem, a sonnet, free verse, blank verse, and rhymed quatrains side by side. Sparrow began mostly as a home for free verse poets, such as Cid Corman, Robert Creeley, John Haines, and George Hitchcock, but in 1992 Stefanile relaunched it as a magazine of the sonnet. Since free verse was now the dominant style, he wanted to serve the embattled side. A lifelong student of Italian Renaissance literature, Stefanile was an unapologetic traditionalist, but he was also an advocate of the avant-garde who translated and published the first anthology of Italian Futurist poetry in English, The Blue Moustache (1981). Finally, Stefanile was a determined individualist who nonetheless always viewed himself as part of a community—ethnic, social, political, and cultural. In these contradictory qualities, Stefanile was quintessentially an Italian-American artist, the product of a culture that combines tribal loyalty with anarchistic independence, reverence for the past with a passion for innovation. Born in 1920, he was part of a pioneering generation of writers born in this country to immigrant parents, raised speaking a foreign language, spiritually and imaginatively shaped by the Roman Catholic Church (even if they eventually left it), weathered by the Great Depression and World War II, educated far beyond the level of their parents, and then set loose upon the world. Both streetwise and book-smart, these young men and women entered a literary culture that simultaneously seemed both foreign and familiar. They chose to assimilate but only up to a point. As children of stoical and clannish Southern Italy, they never entirely trusted the institutions of authority. they are no friends of yours, or friends of mine, John. The central theme of Stefanile’s poetry is the complexity, surprise, and mutability of the Italian American experience. “Even though I insist on calling myself an American writer of Italian descent,” Stefanile claimed in a 1993 VIA interview, “I believe that one of the sturdiest elements in my work is the Italian/American theme.” Like so many other Italian-American writers, he explored himself by understanding the social and cultural forces that had shaped him, his family, and his era. 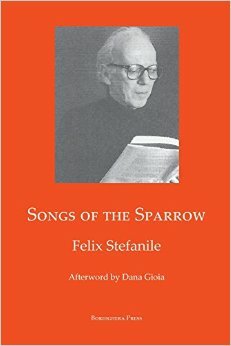 Whether in free or formal verse, a poem must “shine forth” in a form that offers an “understandable and useful” vision of existence.What makes Stefanile’s poetry outstanding among his many first-generation contemporaries was his refusal to simplify or caricature his difficult Americanization. William Wordsworth subtitled his autobiographical epic, The Prelude, as “The Growth of a Poet’s Mind,” which suggested both the personal and general significance of his narrative. Stefanile suggested a similar double perspective—quite Catholic in its insistence of the continuity between the visible and invisible realms of existence–when he told Contemporary Authors, “Art shapes life into form, in understandable and useable relation to spirit.” His poems display the drive for comprehension, articulation, and transformation of life in relation to the spirit. Stefanile strived for claritas (to borrow a term from another Italian writer, Thomas Aquinas)–not “clarity” in the sense of the English cognate but instead “a shining forth” of an object’s true essence. What Stefanile took from both his Renaissance masters and visionary Futurists was that the search for epiphanic moments, however small, was an essential element of lyric poetry. Whether in free or formal verse, a poem must “shine forth” in a form that offers an “understandable and useful” vision of existence. Songs of the Sparrow contains all of Felix Stefanile’s poetry in the original formats in which it appeared—reproducing all seven collections from a River Full of Craft (1956) to The Country of Absence (2000). There is some repetition due to Stefanile’s habit of reprinting older poems in new contexts, but this minor problem is more than offset by the virtue of having all of Stefanile’s poetry gathered together for the first time. All published by small presses, these fugitive volumes are now extremely difficult and expensive to obtain, if one can find them at all. Bordighera Press is to be congratulated for its sponsorship of this important act of restoration. What emerges in Songs of the Sparrow is a poet of superb craft and humane imagination. Reading through half a century of work, the reader finds no period of apprenticeship, nor any sense of decline. Stefanile’s first book contains what may be his finest poem, “The Marionettes,” and his later books are full of gems such as “A Fig Tree in America,” “Elegy, 1942,” and “The Day We Danced the Saint.” Stefanile stands as one of the finest Italian American writers of his generation. Like Ciardi, he brought new voices and new subjects into American literature. His vibrant and immediate poems demonstrate that to be rooted in real places doesn’t make a poet parochial. Seen with a poet’s eye, Queens and Brooklyn are no less universal than Oxford or Cambridge. Stefanile brought the experience of millions of American immigrants—and not just Italians—into poetry for the first time. Isn’t it finally time he gets a hearing?